Temple of Thelema • View topic - Did the Tzaddi/Heh switch change the pronunciation of IHVH? Did the Tzaddi/Heh switch change the pronunciation of IHVH? Case's work attributes a musical note to each of the Hebrew letters through their planetary/zodiacal attribution. According to the tzaddi/heh switch, this means the "Heh" should be vibrated with as an A#/B_flat. Does this switch cary over to this level, or are there other reasons for keeping the frequency at C? 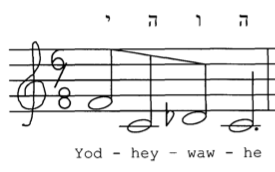 Re: Did the Tzaddi/Heh switch change the pronunciation of IHVH? I've heard both. In testing it out, I've found more strength in matching the tone to the correct color - as per Case's theory that the light wave frequency is simply a much higher octave of the tonal frequency - so that my internal visualization of color matches my vibrated tone. So Heh would be A# rather than C.
I advise that, regardless of what note is rightly (by itself) attributed to each letter, use the traditional sounds (which ignore the note remapping). The last century of use has built up a huge egregore on those fundamental Divine Name sounds, and I think that throwing that out would be our loss. Doesn't the Heh/Tzaddi switch, by definition, require a breaking of an egregore built up since the teachings of the Sepher Yetzirah came into use? How is it less disruptive to correct two millennia of work based on incorrect correspondences but not to correct a hundred years of work that continued the mistake? Especially when the core purpose of Case's color/sound theory rests on visualizing the color at the same time one is intoning the note. Shouldn't we be correcting this now so that it doesn't continue another century into the future? Based on my own experimentation, intoning the Heh of YHVH on a C-natural creates a red thoughtform which pushes me towards Aries and Mars. This is certainly in keeping with the connections between He, 5, Geburah, and the pentagram, but not in connecting it (correctly?) with Violet and The Star.